Frost-free freezer technology, tilt-out drawers, plus more of the latest and greatest new freezer features. Freezers have come a long way since you had to chip away at the frozen tundra of built-up ice to get at the bag of peas for dinner. Now, freezers are virtually all frost free, but that’s not the only innovation in freezer design. Newer models are made to increase functionality, maximize space and optimize storage and organization. Is your freezer in need of a repair or maintenance? Sears Home Services can help. Here are some of the top trends for your modern-day icebox. 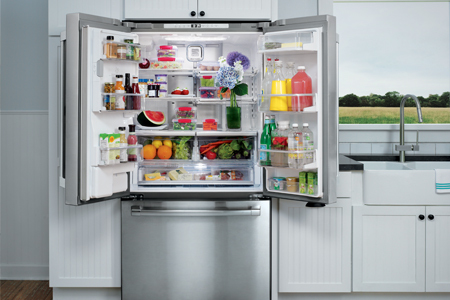 The side-by-side fridge and freezer combo had a good run, but its popularity has been on the wane in recent years. More and more people are choosing the French door fridge, bottom drawer freezer configuration. Why? One big reason is interior space. 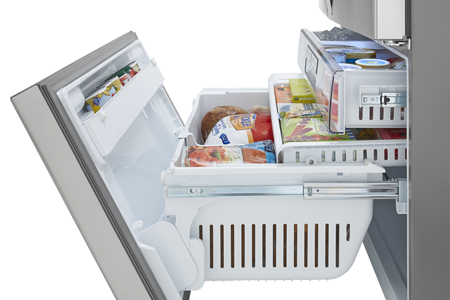 There’s generally more acreage in both the fridge and freezer with this setup, so it better accommodates your needs. We’ve had bottom drawer freezers that pull out for a while now, but a new innovation that’s getting people excited is Kenmore’s Tilt-N-Take 3-tier freezers. These models have two slide-back drawers for convenient storage and freezer organization. The main advantage here is access. With separate tiers and drawers that pull out and tilt, you can easily find and reach frozen treats or leftovers — without having to pull out the entire drawer or dig through everything. Deconstructed fridges and freezers, also called modular styles, are raising eyebrows and gaining popularity. Instead of a fridge-freezer single-unit appliance, we’re talking about two separate units. People who do lots of entertaining are jumping on this bandwagon, especially if they’re doing a full remodel of their kitchen or building a new house. Why? Counter space. These combos typically feature a column refrigerator that’s slimmer and sleeker than traditional models, which frees up more counter space for meal prep. The standalone freezer oftentimes is tucked under the counter out of the way of where you’re cooking, while the fridge is right in the line of fire. Sure, you’ve got your fridge-freezer appliance on one wall, but many savvy cooks are also opting for under-the-counter drawers in their center islands where they prep and prepare their food. These high-tech drawers offer several coolness settings, from wine chilling all the way up to freezer temperatures, depending on your needs for any given meal. With convertible refrigerator-freezers, you get one big compartment with several drawers and shelves, just like you have with a regular fridge. The kicker here is that the entire thing can either be used as a refrigerator or a freezer. You decide, and can change the coolness level with the touch of a button. Why in the world would you want that option in your kitchen? Don’t you need both, all the time? Most people aren’t buying these for their kitchens, but for their basements or rec rooms. They’re using them as freezers if they want to stock up on frozen foods during a sale at a big-box store, say. But if they’re entertaining and want an easy place for keeping beverages, cheeses and dips cold, voilà, it’s a fridge.